Jack Beckman was 7-years-old when he attended his first drag race. 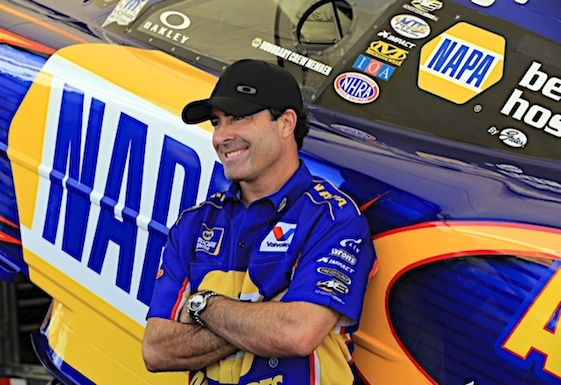 Ron Capps was in the womb. Thousands of time-slips later, fate has returned the Don Schumacher Racing teammates to their Southern California roots, where one will emerge Sunday as 2012 NHRA Funny Car world champion. Thursday’s opening round of qualifying for the 48th annual Auto Club NHRA Finals in Pomona, Calif., maintained the status quo established at The Strip at Las Vegas Motor Speedway two weeks ago. Capps posted his fifth victory of the season in Vegas, pulling to within four points (2,531-2,527) of Beckman’s lead, which definitely is classified as precarious. Consider that less than 100-feet before reaching the finish line on Thursday, the engine in Beckman’s hot rod exploded and destroyed its carbon fiber body. “There wasn’t a whole lot of warning. I have never had that happen to me, and I’m not signing-up for that again,” Beckman joked. “If anyone wants to donate a left eyebrow, I’m kind of needing one right now. Despite that YouTube moment, Beckman recorded a 1,000-foot elapsed time of 4.117-seconds at 273.00 mph as the rain-plagued day’s fifth-best run. Capps, meanwhile, heads into Friday afternoon’s second of four rounds of time trials unqualified after smoking the tires on his NAPA Auto Parts Dodge and posting numbers of 7.675-seconds and 71.87 mph. Rookie Courtney Force, driver of the Traxxas Ford Mustang fielded by John Force Racing, was the provisional No. 1 qualifier at 4.032-seconds and 315.93 mph. ESPN2 will carry a qualifying show Saturday from 6-7 p.m. (EST) and the championship eliminations Sunday from 7-10 p.m. (EST). Beckman recalled that his fascination with drag racing began 39 years ago, on a trip to Orange County international Raceway with his uncle John. “Just the first time I saw those cars, felt those cars, smelled those cars, listened to them and watched them, everything about them was absolutely thrilling,” said Beckman, a 46-year-old native of San Fernando, Calif. “And from that day I knew that I wanted to drag race. My dad (Bob) was a hot-rodder. He liked working on cars. He wasn’t a drag racer but he was always mechanical, so I got that from him, and I bought an El Camino from my dad. “I took my driving test on my 16th birthday in it and then I started tinkering with it – intake manifold, headers, camshaft – stuff like that. I went into the Air Force when I was 17 and was stationed in Clovis, New Mexico. I drove it 100 miles to Lubbock, Texas, and that’s where I made my first run down the drag strip. I still have my time-slip somewhere; it was 15.06-seconds at 90 miles an hour. I got out in ’88 and I started Bracket racing pretty regularly. It was all about getting a good time-slip. The latest issue of “National Dragster” features a photo of Capps standing in the winner’s circle at Vegas alongside his parents, John and Betty, with mom clutching her son’s gold Wally trophy. That rated as a full-circle moment for the 47-year-old Capps, a native of San Luis Obispo, Calif.
“I was in my mom’s belly at my first race,” Capps said. “She used to drive. She actually drove a front motor car when she met my dad, and my dad raced. He was kind of the track champion at the Santa Maria, California, track. As far back as I can remember we went to the March Meet, whether my dad was racing or just in the stands in a camper. And then I was also at Lions Drag Strip, so I’ve got a picture somewhere of the skywriter airplane above me writing ‘The Last Drag Race’ when I was 6-years-old. Capps made his NHRA debut in Roger Primm’s Top Fuel dragster in 1995, earning his first victory at Kent, Wash., during an abbreviated 14-race schedule. His driving prowess eventually caught the eye of NHRA legend Don “The Snake” Prudhomme while running a limited, six-race Top Fuel schedule in 1996. Beckman served in the Air Force from 1984-88, exiting as a sergeant with his street legal-but-stealthy El Camino and a new career direction. “When I got out of the Air Force I went on the road with a nitro Funny Car team, Tim Grose, and I thought that was going to be a ticket to eventually get behind the wheel,” Beckman said. “I was the bottom-end guy on that car. Unfortunately even back in ’88 things were the same _ it took money to run these cars _ and after a couple months the sponsorship wasn’t coming in and I had a good job offer from Westinghouse Elevator and I wound up doing that as a career for 10 years and racing my own car. Beckman underwent his eighth and final chemotherapy treatment on Oct. 25, 2004, when the cancer was declared in remission. In April 2005, Beckman made his NHRA Top Fuel debut for car-owner Dexter Tuttle, beating fellow-rookie Ben Marshall for his first round victory. Recall that Capps failed to qualify for the March NHRA race at Las Vegas, a weekend that saw veteran crew chief Tim Richards resign in frustration four events into the Full Throttle Drag Racing season. That prompted team-owner Schumacher to order a massive crew chief/crew swap between the Beckman and Capps camps. 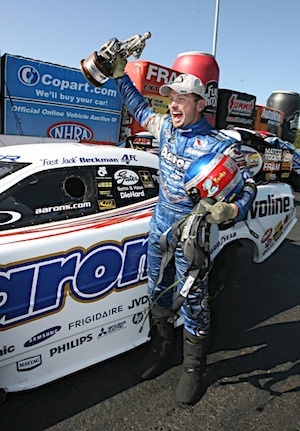 Beckman was paired with crew chief Todd Smith while Capps joined championship-winning tuner Rahn Tobler. “I don’t know, I’m in a weird frame of mind right now,” said Capps, who has posted a class-leading 44-16 won/loss record this season. “Going into Vegas, I knew what we had to do and to come out with a win like we did was great. But I found myself with a really strange calming effect on Sunday (Oct. 28). I think it had a lot to do with Rahn Tobler and my team and just we found our car again and we were back to what we did earlier in the season, all those final rounds and just the confidence that was built, that it helped me as a driver. “I really found myself in a good place on Sunday driving the car. It was kind of strange because I’m always talking about how a lot of drivers kind of hide the nervousness that we get. I’ve been pretty vocal and not afraid to say, ‘Look, I was throwing- up this morning before first round’ or whatever it took, and I’ve always done my job in the cars even though I either had anxiety or was nervous as I was. Beckman noted that he was in a similar position at Pomona one year ago, when DSR teammate Matt Hagan was bent on capturing the title he had lost to 15-time world champion John Force in 2010. “We ran Matt Hagan in, I think, the second round in Pomona and that could have been the (2011) championship had we been able to beat him,” said Beckman, a three-time winner this season and 36-18 overall in rounds. “They outran us and they got a well-deserved championship, but fortunately we’re right back in a position to win it again this year. “I totally agree with Ron. I taught at the Frank Hawley School for 11 years, still teach there on occasion, and students used to ask me how come you don’t get nervous? And I said, ‘What would make you think I don’t get nervous?’ I’m human and I absolutely get those butterflies and that feeling. It’s what you do with it and it’s how you manage it. And you’d like to think that when you get in that moment that you’ll perform OK. But unless you’ve been tested, you don’t know for certain. And I would say the same thing. “Sunday in Vegas every round was absolutely crucial, but I felt pretty confident. And the interesting thing is we didn’t have the car that we’d had the last nine races. So I’m not quite sure but the confidence did not come from knowing we had the best car that day. I think it came from knowing we had a good car, we had a good chance of winning, and that no matter what, based on all the changes earlier this year and us dipping down to sixth in the points, we’re right back in the hunt on this. And that’s all anybody can ask for.